Competition results are being published to the online scoreboard service, we thought it would be useful to publish again some guidelines on how members can use these new facilities. An external website (Master Scoreboard) – link available on the SGC homepage – provides a password protected access to the results of all competitions that have been played, all current handicaps and information personal to your own playing history. The Master Scoreboard service is an online facility to check competition results, handicaps and playing analysis. 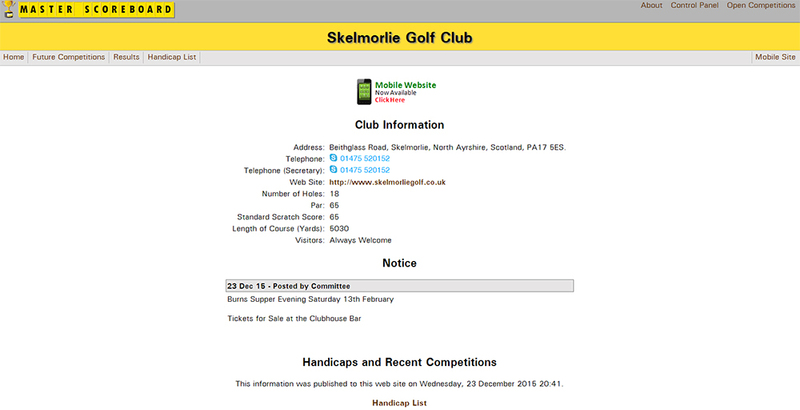 Skelmorlie Golf Club will publish competition results as appropriate once a competition is closed. In effect this service has now replaced the howdidido service previously used. There are a number of ways to access the master scoreboard, which is a simple password protected web page on the Internet. You can go directly to the Master Scoreboard website url, then search for SGC. You can also access by various links on our website – which take you directly to the SGC login page, these are on the home page, main menu under Competitions then ‘Results’, or from the Champions Board page where there is also a direct link button, the choice is again yours. Whichever option you take, you will end up on the login page for SGC where you will have to select your name, and enter a password to gain access. On first use you will need to use a default password initially, but then will have to set your own private password which is then used for all future logins. Default passwords will be provided to members by email where they have one or can be requested from the club. Once logged onto your home page of Master Scoreboard, you are presented with some basic information about the club, notices, a list of the recent competitions you have played in and access to a Handicap listing of all the players at SGC. If you go to MyGolf on the menu bar, you are presented with options to view your own handicap Information, playing history, playing analysis, handicap certificate, national ID and the ability to turn on or off email notifications. You can also view from the menu bar, future competitions, all results published, all handicaps, select a mobile site facility if your using a smartphone or other smaller screen device, which then provides for easier small screen usage, change your password and finally access the logout option when your finished. This is a fully comprehensive results service which is well presented and should cover most needs, but if you have any problems or issues please let the club know and we will look into it. Hope this helps you get started with all the new online results facilities.